The Gish Bar Times: New Io Data! Hallelujah, praise Jebus! New Io Data! Hallelujah, praise Jebus! Believe it or not, but public information on recent volcanic activity on Io has been pretty limited. 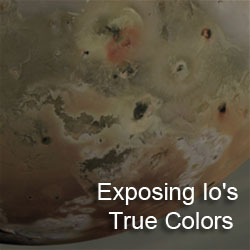 In fact the last report on Io's volcanic activity that is available to discuss here came during the New Horizons encounter back in late February 2007, more than three years ago. Thankfully, that information drought has finally, mercifully come to an end! Franck Marchis posted on his blog at Cosmic Diary results and images he and one of his undergraduate assistants, Keaton Burns, of Io on June 28. Using the adaptive optics system on the W.M. 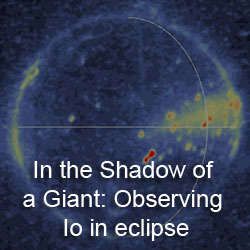 Keck II telescope on the Big Island of Hawai'i, Marchis was able to image Io at several near-infrared wavelengths during a break between searching various asteroids for satellites (a project Marchis has previously been quite successful with). On his blog, Marchis posted a set of images taken at 2.1 μm (Kp), 3.8 μm (Lp) and 4.7 μm (Ms) of Io's anti-Jovian hemisphere. The 2.1 μm image shows mostly reflected sunlight, but the other two reveal thermal emission from Io's volcanoes. 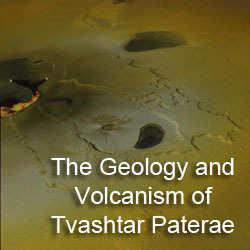 More volcanoes are visible in the 4.7 μm image because cooler (read older) lava can be detected at longer wavelengths. Both the 3.8 μm and the 4.7 μm images revealed emission at the usual suspects like Marduk, Prometheus, and Zamama, with the most intense hotspot located at Pillan. Looking at the image myself, you can also see additional, fainter hotspots can be seen at Rata, Culann, and Isum, as well as a new hotspot near a volcano at 6 degrees South, 190 degrees West. I need to head out the door right now, so I will definitely have more when I get back.